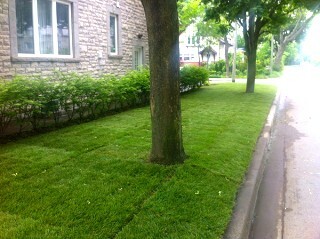 You new lawn is composed of thousands of live grass plants. To encourage them to thrive in their new home and provide you with a velvety carpet of grass, here’s what you must do. 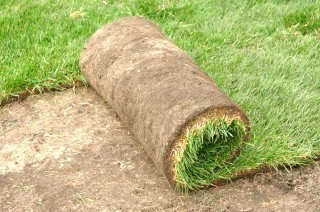 Your sod must be kept thoroughly soaked for the firs week to 10 days. It takes a lot of water to penetrate the sod and the soil below it. Let the sprinklers run at least an hour in a spot except on steep slopes. The edges of the lawn and the parts along the walks and house are most likely to dry first, so make sure to water heavily and frequently in these areas. Steeply sloped lawn areas may slip if watered too heavily. Water these spots more frequently but not as heavy. Generally each spot will need a thorough soaking every other day unless it is very HOT…then every day. Your grass always let you know if it is not getting enough water. If the sod begins to shrink and the seams open, it’s drying out. If the grass looks gray and doesn’t spring back up when you walk on it, it is wilted and needs water. After you soak the lawn the first time it will be very soft. DO NOT WALK ON IT. You will poke big holes in the lawn. Set your sprinklers so that you can pull them to the next spot with the hose without walking on the grass. Do not use the lawn or allow children on it for at least 2 weeks or until it is firm enough to prevent footsteps. When the grass gets about 3″ tall, usually 1 week to 10 days after it is installed, stop watering. Wait for the grass to get firm enough to walk on. Then with a sharp, lightweight, rotary mower, set to cut at 2″ – 2½” high. Cut the lawn and pick up the clippings. Water the lawn immediately again. From this time on the grass must be cut at least once each week but never mow shorter than 2″. Now, you can reduce watering to twice a week for the first month and then to once every 7 – 15 days. Continue watering and cutting just as long as the grass grows in the fall. Do not use a commercial fertilizer before your lawn is 3 months old. Then your lawn requires a “3 feeding per year” Schedule. NEVER USE WEED KILLERS FOR THE FIRST SIX MONTHS. If an area of lawn settles or becomes damaged by walking on it while too wet, lay back the sod, put some topsoil under it, relay it and treat as newly laid sod.